Everyone knows someone who has been through a divorce. For some, it was one of the worst experiences of their lives; but for others, things went a little more smoothly. No matter what you might think will happen with your case, you need to sit down with an experienced attorney to truly understand what is at risk if you make the wrong decisions. 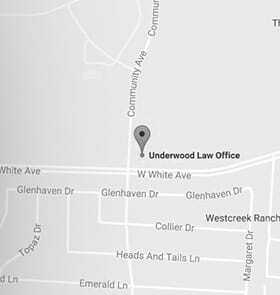 At Underwood Law Offices, with locations in McKinney, Texas, and Huntington, West Virginia, our legal team is here to help you and your family through these challenges. With more than six decades of combined legal experience, we take a very proactive approach in your case. We work hard to protect your assets, as well as the time that you can spend with your children, throughout the divorce proceedings. Going Through A Divorce In Texas? Under the divorce laws of Texas, it is a community property state. This means when you file for divorce the courts require all property that is acquired during the marriage (with limited exceptions) to be divided equally between the spouses. Whether you feel this property is yours and yours alone does not matter to the courts. Getting A Divorce In West Virginia? West Virginia does not have community property laws, but you still need to take the property division portion of your divorce seriously. An experienced divorce lawyer will be able to help you understand the grounds for divorce and what your life will be like after things have finalized, so that your strategy takes your specific needs into account. You will be able to feel confident that the results you obtain will allow you to be in a much better place once things are over. Both Texas and West Virginia use the best interests of the child to resolve child custody disputes. Our attorneys will help you effectively demonstrate why your custody, parenting plan and time requests should be approved by the courts. Need Help With Your Divorce or Child Custody Case? The Family Law Attorneys at Underwood Law Office are ready to help you with your divorce or child custody case. In Dallas Fort Worth, our McKinney attorneys serves all of DFW, including Allen, Frisco, Plano and McKinney, Texas. In West Virginia, our Huntington, West Virginia attorney office represents clients across the entire state. Call our toll-free number 844.UNDERWOOD (844.863.3796). If you need assistance with a divorce or child custody case, please call us today or send us an email. Our divorce and child custody attorneys are here to help you. Se habla español.